>I’m rather pleased with myself, though it’s hardly deserved. I was working on 4-data set Venn diagrams about a month ago and told Steve that “this is as high as I think we can go. We won’t be able to visualize any higher order data set overlaps”, and then managed to prove myself wrong today. It’s not like I invented a new branch of math or anything, but hey, that’s pretty darn cool. The triangle sizes are roughly proportional with the size of the datasets, which I didn’t even think i could approximate, and I even like the look of it. While I knew this wouldn’t be possible with circles (I had played briefly with rhomboids and triangles before), I was stuck until I saw this picture, and then realized that there was a much cleaner way to assemble the triangles using parallel edges, and tada, we had a winner. 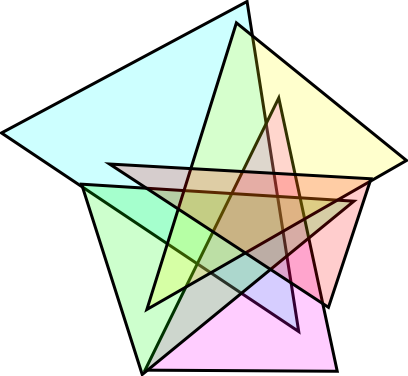 Obviously, the more generalized version using identical sized triangles can be done as well. 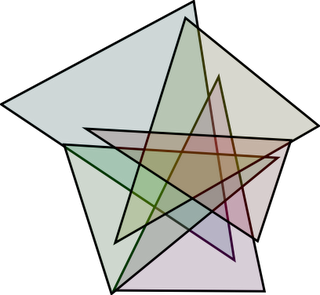 In inkscape, it’s relatively easy make a 3 sided polygon, copy it 4 times and then rotate each one by 72 degrees and layer them with some opacity. Aren’t Venn diagrams fun? I hear the chorus calling me a geek, so I’ll move on to other topics. I’m currently planning on resuming my blogging with more frequent updates. The last month was a good break, giving me a bit more time to catch up on other things (research), but I’ve saved up several topics, and I’m ready to get going again. I’ll try for at least 3 a week for the next while. Wish me luck.